I know I’m not the only female gamer seriously drawn to SWTOR, BioWare’s upcoming Star Wars MMO. 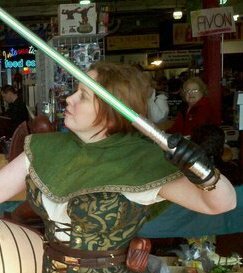 After reviewing the classes, I decided on playing a Jedi Consular with a Sage spec (force user/healer). When LARPing and playing MMOs, I like playing various roles, but I’m most effective as a ranged fighter and healer–especially when there are some good tanks around. My strategy in text-based RPGs and tabletop games is stereotypically squishy! I like to power up my character’s magic as much as possible. Once I trust the other players (and once my character trusts the other characters), I don’t mind operating this way. I feel like I can really contribute. Usually I like to hang onto a few different pieces of armor (depending on what I’m allowed to wear in the game) to change things up depending on the situation. If I’m running without my husband or trusted tank friends, I’m likely to add a bit of defense to my character using armor. I’m hoping the armor/clothing usage won’t be too complicated in SWTOR and that I can switch pretty easily. In everything but the recent SWTOR Jedi Consular preview, I’ve noticed that the Jedi Consular example is female. Back when I was just playing in the Star Wars universe in tabletop, I was already drawn to this class and this leads me to wonder why. I think some people (not just women) like to feel needed and depended upon, hence the desire to be a healer. However, I don’t like to simply serve in a support role. To feel really effective, I need to blast the crap out of the enemy. This may add to my own stereotype, but I’m just not into tanking or tactics. I just like to zap people. Want to join an awesome guild? Check out Honor Guard of the Republic.